A satisfying conclusion to the trilogy that gives closure to the microcosm we have been following with an open end of the macro chaos defined by the world at large. One of the taglines for this movie: Every Maze Has An End. A young man leads a group of fellow fugitives from a clandestine corporation’s experiment on a dangerous mission to save their captured friend. To do this they must break into the corporation controlled city fortress with the help of allies driven by chaotic motivations and former comrades who have betrayed them due to the promise of answers to questions that could not only save them but humanity. 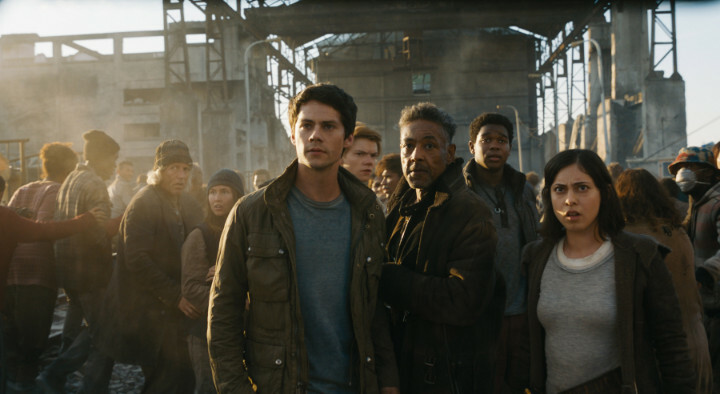 Thomas leads a group of ‘Gladers’ to WCKD’s legendary Last City to free his friend Minho and the other Immunes to strike a blow against the organization that has taken so much in the name of finding a cure to the ‘Flare’ virus. Brenda is a member of The Right Arm with a budding attraction to Thomas who is willing to follow him into danger partly due to a serum made from his blood that saved her from becoming a Crank. Lawrence is a leader of the Flare-infected rebels who surround the wall around the Last City who has one of the Immunes in his rebel army. Assistant Director Janson is the highest ranking official in WCKD under Chancellor Ava Paige, but his impatience for the finding of a cure grows as the virus becomes airborne and he makes it his mission kill Thomas. Maze Runner: The Death Cure is a truly epic finale to the trilogy that completes the story of the group we have become attached to while leaving a glimmer of hope for the future of the human race around the globe. The action scenes in this final installment are able to out do the ones of the other two films while giving us better character development than the previous film which places this one higher than the second entry but not as high as the first in rank of cinematic quality. Dylan O’Brien, Thomas Brodie-Sangster, Ki Hong Lee & Rosa Salazar bring strong performances to their different characters that tie your emotions to their success in such a way that every defeat is heartbreaking and every victory is breathtaking. Wes Ball is able to enter the hallowed hall of directors with a trilogy under their belt and even though the second entry was not the best this closing chapter made up for it. T.S. Nowlin’s screenplay shows improvement over his last solo effort of adapting James Dashner novel and I look forward to seeing the fruits of his script writing labor on future projects. The event in this story used as a metaphor for youth coming of age in a changing reality is delivered in an appropriate manner to wrap up the franchise. It is sad that the delay of the film’s 2017 release date due to the on set injury of its star cost it much needed momentum with a stagnating genre but this film can stand on its own. I rate this motion picture a rating of 3 & 1/2 out of 5.